Hi! I'm introducing something a little different. I thought I'd throw in a bit of "fashion". I thought I'd share with you what I wear to church on Sundays. Sunday, is basically the only day I get dressed up. Unless hubby is taking me out or there is a special event. Otherwise, I'm in paint covered jeans and a big sweatshirt, hair in a ponytail headed out to the apartments to work. But on Sunday's, I enjoy getting dressed up, fixing my hair and makeup. 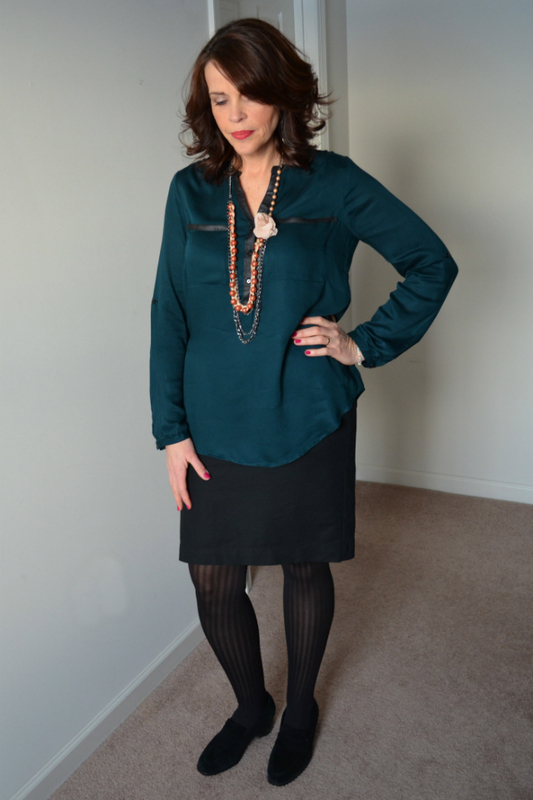 So, here is what I wore yesterday, and I'll share some thoughts on it. I love this teal blouse my daughter picked out for me at Ross. I really like the "pleather"(plastic, looks like leather) detail on the collar and pockets. I wore it loose, but I was thinking of getting a skinny black belt. I think that would look nice too. The skirt is from Target on the clearance rack! :) Yay! It's just a straight skirt with slash pockets, very simple and classic. The tights are from Walmart. They have fun stripes on them, I like something a little unexpected. The shoes are ancient, I couldn't even tell you where I got them. I'm into my 3rd week of recovery since my hysterectomy and I'm finally able to wear my regular clothes, which thrills me! I'm very glad that I can easily fit into one of my favorite black skirts. personally, this is the shortest I will go. And... I will only wear a skirt this short with tights. My legs have lost their firmness and tend to be a bit veiny. it doesn't seem to draw a lot of attention to the length of the skirt. For me, at my age, I'm thinking I want to be a bit more modest. What age do you think women should stop wearing minis?